The Salt Mine presents another great piece from Max Gilmore. This time a little out of our typical wheelhouse. This time, Max talks about Vintage. Enjoy! I’m a Blue player. Drawing cards, countering spells, wondering how many consecutive turns I can go without flipping Delver: those experiences are why I play Magic. Before this journey to the Colorless Side, I had never cast an Arcbound Ravager in my life. 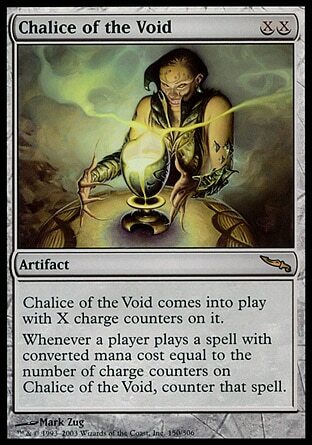 My only prior experience with Chalice of the Void was trying to resolve my own spells through my opponent’s Chalice on 1. 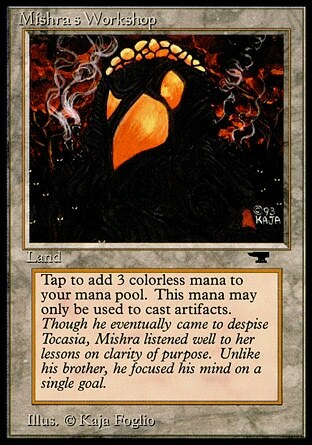 I’ve been playing Vintage for about 6 months, and the primary reason is to help satiate this desire to draw cards. A little over a month ago, I was looking to purchase few Mox Opals on Magic Online. I was hoping to expand my collection to include the card-drawingest of card-drawing decks: Paradoxical Outcome. 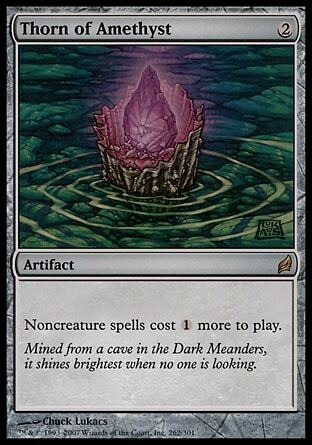 However, when I saw the price of 3 Mox Opals, my jaw hit the floor. “I could spend less than that and have an entire Workshop deck,” I thought, incredulously. “I could spend less than that and have an entire Workshop deck,” I realized, deviously. Workshops, or “Shops” for short, is a Vintage archetype based around the power of the card Mishra’s Workshop. This one land adds 3 mana to your mana pool. That’s Black Lotus amounts of mana, but reusable every turn. While you can only use this mana to cast artifact spells, combine this land with the mana-producing artifacts that are legal, albeit restricted, in Vintage, and you’ve got absurd amounts of mana at your disposal as early as the first turn of the game. 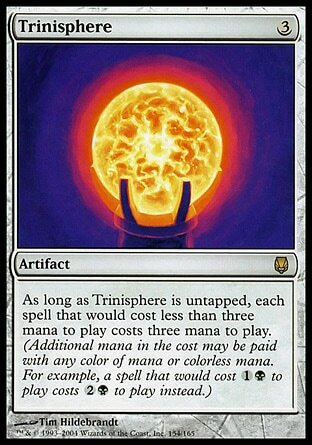 Imagine this: You win the die roll, and lead with Mishra’s Workshop into Trinisphere. It resolves. Your opponent isn’t going to be casting anything until they get 3 lands in play, since their measly lands only tap for 1 mana each. In the meantime, you’re casting the powerful artifact creatures that make Modern Affinity such a formidable deck, and Wastelanding the lands that your opponent is playing in their attempt to build up to their first 3-mana play. Your aggressive creatures end the game before they even get to cast a spell. While not all games are quite this lopsided, the power of the artifacts that the Shops deck can cast should not be understated. 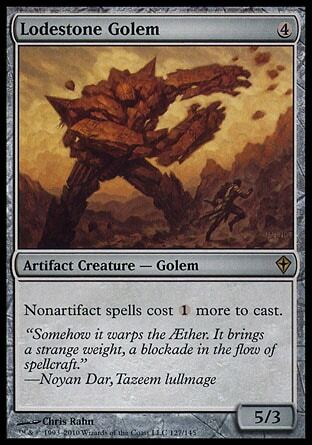 Between 4 Sphere of Resistance, and the restricted singleton copies of Thorn of Amethyst, Lodestone Golem, Trinisphere, and Chalice of the Void, supplemented by a few Phyrexian Metamorph, it’s quite easy to lock your opponent out of casting any meaningful spells until it’s too late. 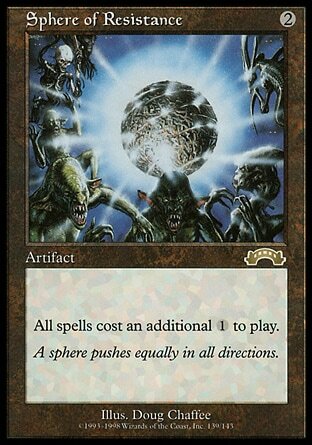 In the meanwhile, you’re breaking the symmetry of these Sphere effects with your lands able to produce multiple mana. You slam down some aggressive creatures and win the game in short order. The DCI has gradually been restricting the lock-pieces of the Shops deck in order to bring the power-level in line with the rest of the Vintage format. These open slots in the deck have been replaced by cheap, powerful creatures from the recent Magic sets, such as Foundry Inspector, Walking Ballista, and Hangarback Walker. These inclusions make the current iteration of Shops as much of an Aggro deck as it is a Prison deck. Which game plan takes precedence depends on which you perceive to be more annoying to your opponent at the time. With a great draw, like Workshop into Foundry Inspector + Sol Ring + lock pieces, you can sometimes even pick both! No Mox Opals, but one fully assembled Ravager Shops deck later, I fired up my first league. I went 3-2, playing terribly. I tried again, playing slightly better, and went 5-0! Played another league after that: 5-0 again! Finding myself at 4-0 yet again in the league following, the reality of this deck’s power kicked in. I couldn’t lose! 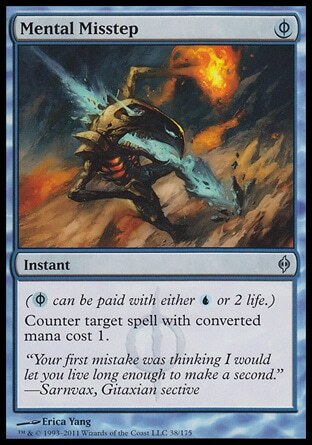 I then overcommitted into a line that sacrificed my entire board to an Arcbound Ravager to put a lethal number of +1/+1 counters on Walking Ballista. My opponent had removal in response to the attempted transfer of counters, and I was reminded that I did have the option to lose if I chose to do so. At this point, I decided that I was going to play and record 100 matches with Shops in order to see just how good this deck really was. I believed this 80% win rate over the first 20 matches to be clearly unsustainable, but that it would be interesting to see where it ends up. I slightly modified my Shops list to look a lot like what Rich Shay played to 2nd Place at 2017 Eternal Weekend, and threw it into a Vintage Challenge. A day’s worth of Shopping later, and I had won the event. Over the course of the 100 matches, I tried a lot of different configurations of the deck. Regardless of the specific cards I was using to battle, I just kept winning. At the end of 100 matches with Shops, my record stands at 81 wins and 19 losses. My MtGO constructed rating peaked at 1938, and could have been even higher if I had the willpower to not intersperse some 3-2s with Blue spells between Shops leagues. I’ve never had that kind of sustained success with a deck before. Normally, I win around 70% of my Magic Online Competitive League & Challenge matches with Blue decks, so to see my win percentage continue to hold at over 80% speaks to Shops’ insane power level. Off-color Moxen imply Big Blue, but the omission of off-color Moxen does not necessarily mean Xerox. For example, I consider Landstill to be Big Blue, but it only plays on-color Moxen. While Oath of Druids decks are, in theory, supposed prey on Workshops, I still had a 70% match win against the so-called predator. While that’s certainly lower than my win percentage against other Blue decks, it’s a far cry from a bad matchup. Another note is my 15-1 record in the Shops mirror. Up until the 99th match, I was 15-0 in the mirror, and very excited to claim an undefeated record. Then, Eternal Weekend 2017 Champion Andy Markiton strolled in and wiped the floor with me. The takeaway, however, is consistent: while winning the die roll can’t hurt, the better Shops player is extremely favored in the mirror. One way to fill out the creature flex slots is with 4 Steel Overseer and 3 Hangarback Walker, popularized by masters of the format such as Eternal Weekend Finalist Rich Shay and Champion Andy Markiton. This Steel Overseer + Hangarback Walker package is the more common choice, and provides significant staying power. Steel Overseer interacts very favorably with Arcbound Ravager, Hangarback Walker, and Walking Ballista. Given a couple of turns, Steel Overseer pumping these cards can break almost any board stall. There is probably no more potent combination of creatures than Arcbound Ravager and Hangarback Walker. I’ve won multiple games against Oath decks with active Griselbrand by combining Arcbound Ravager’s sacrifice ability and Hangarback Walker’s thopters in order to push through damage while using the Thopter block + sacrifice trick to negate any Lifelink from the opposing Griselbrand. The other creature flex slot package is with 4 Chief of the Foundry and 3 Fleetwheel Cruiser, popularized by Eternal Extravaganza 6 Champion Nick DiJohn. This configuration is slightly faster, with Fleetwheel Cruiser able to throw a ton of Hasty Trample Damage to end a game quickly. Conveniently, Chief of the Foundry has 2 Power, the perfect number to Crew Fleetwheel Cruiser should you need to attack again. This build is designed to be slightly better against Combo and Oath. One factor for this is that the faster creatures can shave a turn off of your opponent’s setup time, while the second factor is the noncreature nature of Fleetwheel Cruiser. With a Fleetwheel Cruiser and a Mishra’s Factory, you can push 5 damage at your opponent without triggering the Oath of Druids on your opponent’s upkeep. More commonly, you react to the resolved Oath of Druids by sacrificing all of your Creatures to Arcbound Ravager, sacrificing Arcbound Ravager to itself, and throwing all of the +1/+1 counters on to the Fleetwheel Cruiser. If your opponent doesn’t have a Dack Fayden or Ancient Grudge, you can often win on the following turn. There is an interesting phenomenon that occurs in the Vintage metagame. Even if Shops is 20% of the field, and Dredge is 10%, that means that approximately 70% of your expected opponents are playing Blue decks of some sort. When considering Blue deck construction, if 70% of your opposing matches are Blue mirrors, you’re going to want your main deck to be configured to win Game 1. 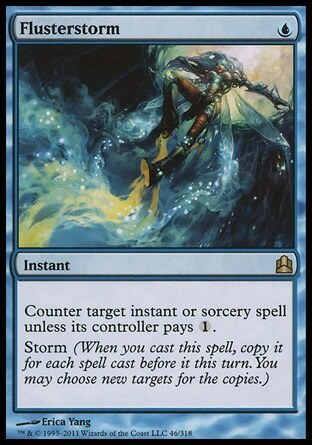 This means that Blue decks are usually packing a full playset of Mental Misstep alongside a couple Pyroblast or Flusterstorm. You want to resolve your own Ancestral Recall and Jace, the Mind Sculptor while preventing your opponent from resolving their own. The problem, of course, is that these cards do next to nothing against Shops. This “Blue Arms Race” represents a classic Prisoner’s Dilemma. If every Vintage Blue player got in a room together, they could agree that if these 6-7 card slots weren’t filled with dead cards against Shops, perhaps the matchup might not be quite so lopsided in favor of the artifact menace. They could then all mutually agree to not play these cards in their main deck, and instead play cards that are also more useful against Shops. If every single Blue player did that, the problem would be solved. Blue players would still be evenly matched against each other, but now they can also beat Shops too! The problem is, of course, that any Blue player who defects and opts to play these Mental Missteps and Pyroblasts in their main deck is now a heavy favorite against 70% of the field! This devious Blue player can let the more tempered Blue decks deal with Shops while they come out on top in Blue mirror after Blue mirror in the winner’s bracket. Therefore, no one scales back on the “Blue Arms Race,” and Shops continues to dominate. The argument, then, is that if the DCI steps in restricts Mental Misstep, this forces the Blue players to scale back on these cards. Perhaps, then, they’re all forced to play different cards in these slots, and these cards might be better against Shops. It also opens the way for Crop Rotation and other sweet cards to reenter the format, and decks like Vintage Lands can sport a very strong matchup against Shops. If that all seems like a too roundabout and hand-wavy way to weaken Shops, and you’d rather just take another chip out of the old Shops block, the next card to get restricted should probably be either Foundry Inspector or Sphere of Resistance. Playing 100 matches with the Best Deck in Magic opened my eyes to a completely different world. Navigating wins with a Blue deck can feel like it takes finesse akin to a fencing match. In this analogy, Shops would be entering the same fencing match, but switching out your épée for a sledgehammer. As a Spike, sustaining a win rate over 80% was invigorating. As the father of a 6-week-old baby, winning this much while in a sleep-deprived delirium felt surreal. As a Magic Online player, the influx of tickets made me the proud owner of three shiny new Mox Opals.